The Ashland Cemetery is located in the village of Wellsburg, Town of Ashland, Chemung County, New York, on a gentle sloping hillside behind the historic Baptist Church and its old and picturesque graveyard. It ranks high among the better cared for burial grounds in the county, being always neatly mowe, with no weekds or unsightly brush. Less than a dozen tombstones are on the ground. The date of the first interment is unknown, but is estimated to have taken place in the 1830's. It is possible that the number of unmarked and "lost" graves could exceed one hundred. The current interment record was begun in 1913 when the Ashland Cemetery Association was formed and the present name adoped. 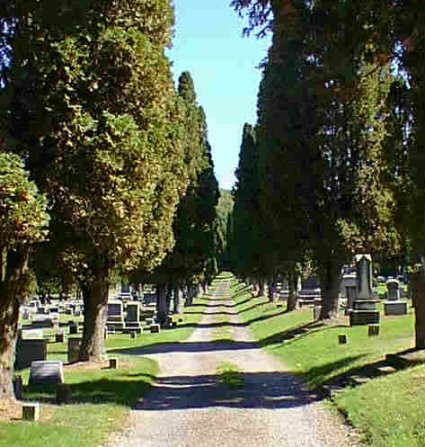 Prior to that year the cemetery was known as the "Mountain View Cemetery." Occasionally it is alluded to as the "Wellsburg Cemetery". 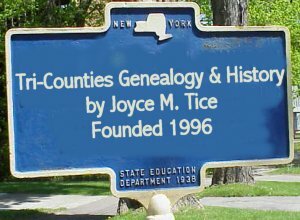 It has been stated that the original records are still in existence but that their location is unknown..
All data on all tombstones was recorded by Doris and Joseph Boyd for the Chemung County Historical Society on August 2,3,8,13,19, and 21, 1977, for a total copying time of 17 hours. Through the courtesy and co-operation of the cemetery commission, additional burials and data was secured from the cemetery records; also from the Roberts Funeral Home, Wellsburg, for the period between November 1970 and July 1977. In the case of some wives, sons and/or daughters, the surname has been added for the sake of clarity. Data in brackets does not appear on the tombstone, but is a supplement for historical interest. All names on a single stone are grouped together, without alphabetizing, to keep family members together. (Sorry, list was alphabetized-jmt) CR indicates Cemetery Records. Allen William H. Feb 23 1837 Apr 22 1906 Co. C., 161st Regt., N.Y. Vols. Baker George W. 1845 1923 "Father" Co. H. 3rd Batt., 16th U. S. Inf. Baldwin Charles 1927 1872 "obvious error or transpositions-check cemetery"
Bevens Belle Pierce 1856 1922 CR: d. Brooklyn, N.Y.
Bountain Antoinnette 1841 1919 "Mother"
Bountain James M. Sep 6 1882 39 yrs. 2 mos. 13 dys. Sgt. Major 2nd N.J. Cav. Bountain William H. Jun 6 1875 55 yrs. 11 mos. Bowman Betty See entry for EARL E. STEWART, SR.